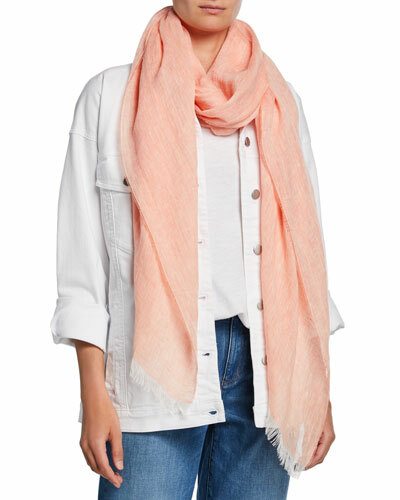 Revamp your wardrobe with Neiman Marcus’ collection of designer wraps and stoles in impressive designs. 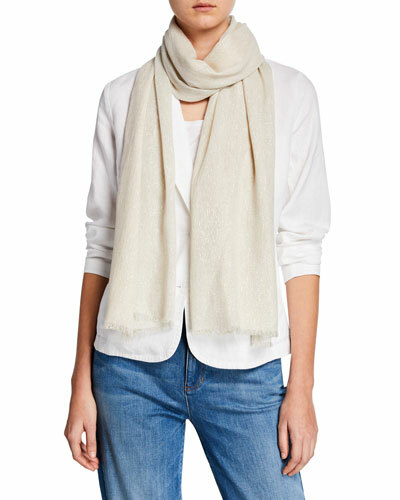 We offer you a fine selection of cashmere wraps and stoles that are crafted by some of the world’s best designers. From mink fur stoles and fringe wraps to wool-blend wraps and silk stoles, we have a diverse style in store for you. Whether you’re enjoying a sunrise by the sea or talking a stroll down the sandy beach, a vibrant skinny wrap from our collection will add brightness to your perfect day. 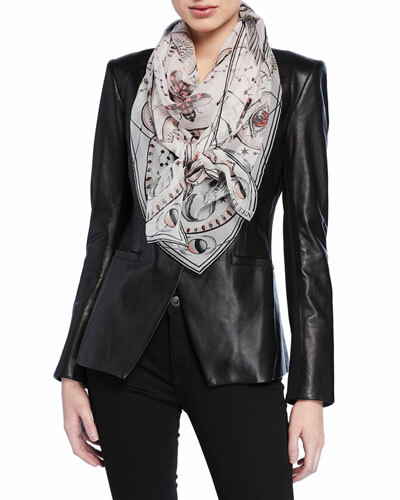 Our stoles and wraps are designed in exceptional styles for fashion-forward women. 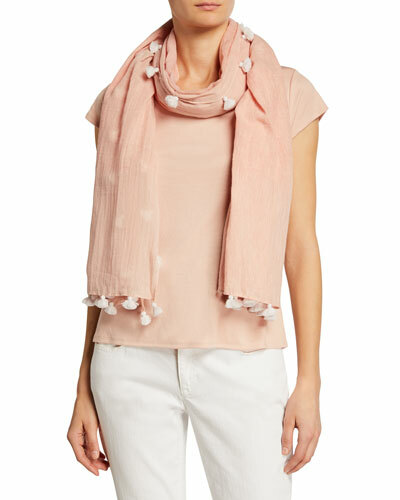 Shop a variety of women’s wraps and stoles by leading fashion designers at Neiman Marcus. Bindya Accessories "Opposite Attraction" stole with lace trim. Approx. 40"W x 80"L (102 x 203cm). Lightweight, seasonless fabric. May be styled multiple ways. Eyelash fringe ends. Modal. Dry clean. Imported. Model's measurements: Height 5'10"/177cm, bust 33"/84cm, waist 25.6"/65.2cm, hips 35.8"/91cm, dress size US 2-4/FR 34-36. Bindya Accessories "Opposite Attraction" stole with lace trim. Lightweight, seasonless fabric. May be styled multiple ways. Eyelash fringe ends. Modal. Bindya Accessories "Opposite Attraction" stole with lace trim. Lightweight, seasonless fabric. May be styled multiple ways. Eyelash fringe ends. Modal. Imported. Model's measurements: Height 5'10"/177cm, bust 33"/84cm, waist 25.6"/65.2cm, hips 35.8"/91cm, dress size US 2-4/FR 34-36. Bindya "Pumice" evening wrap with asymmetric metallic lace overlay. Approx. 80"L x 28"W. Finished with fringe and scallops. May be styled multiple ways. Wool/silk. Imported. Model's measurements: Height 5'10"/177cm, bust 33"/84cm, waist 25.6"/65.2cm, hips 35.8"/91cm, dress size US 2-4/FR 34-36. 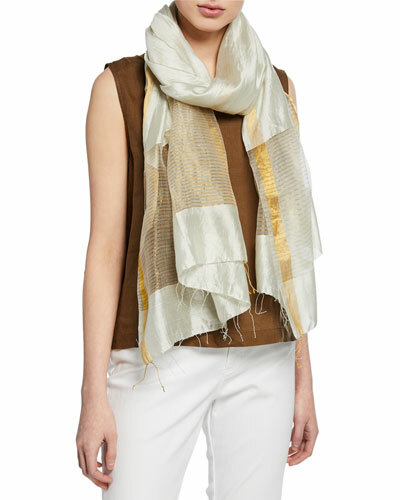 Faliero Sarti L'Acessorio "Dionisio" gradient scarf with woven tinsel detail. Approx. 78.7"L x 35"W (200 x 90cm). Ample size to style multiple ways. Eyelash fringe edges. Silk/nylon. Made in India. Model's measurements: Height 5'10"/177cm, bust 33"/84cm, waist 25.6"/65.2cm, hips 35.8"/91cm, dress size US 2-4/FR 34-36.